Electrical system problems of the heart may make the atria beat faster than normal. If the atria beat quickly, but still evenly, it is called atrial flutter. If the atria beat very quickly and unevenly, it is called atrial fibrillation. The atria may beat quickly only once in a while (paroxysmal). Or, they may beat quickly all the time(chronic).Atrial flutter or fibrillation can be caused by such things as a heart attack, high blood pressure, or a thyroid problem. Or the cause may be unknown. Symptoms of Atrial Fibrillation: Palpitations (a fluttering, fast heartbeat), weakness or tiredness, shortness of breath, chest pain or tightness, dizziness or lightheadedness, or fainting spells. 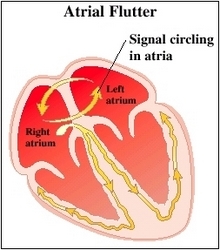 With atrial flutter, signals travel around and around inside the atria. Circling signals tell the atria to beat quickly. Atrial flutter can cause symptoms similar to atrial fibrillation. It can also lead to the even faster, uneven rhythms of atrial fibrillation. 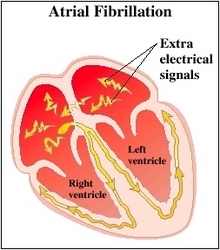 With atrial fibrillation, cells in the atria send extra electrical signals. These extra signals make the atria beat very quickly and unevenly. The atria beat so fast and unevenly that they may quiver instead of contracting. If the atria don’t contract, they don?t move enough blood into the ventricles. This is what leads to symptoms such as dizziness and weakness. Blood that isn?t kept moving can pool and form clots in the atria. These clots can move into other parts of the body and cause serious problems, such as a stroke.